keep a journal. I use the notes app on my computer and will ramble on in there throughout the day. I have been doing this on and off for over a year and I find the times that I do do this, I am much more productive and in tune with my feelings and my health in general. move. Exercise, do yoga, walk, dance, stretch, stand up while working, just MOVE. eat what you TRULY crave. I don't buy that you truly crave mozzarella sticks. Think about it....what does your body really want? What will make you feel energized and vibrant? meditate. I need to do this more. and I am going to take my own advice and do it TODAY. Just stop. sit. clear your mind. breathe. even for 5 minutes. give yourself healthy treats. This doesn't mean a glass of wine or online shopping. I am talking about an activity that will make you feel BETTER afterwards. Like a bath, reading your book, listening to music and dancing around the living room, doing a face mask, taking your pet for a walk, whatever it is that makes you feel relaxed, at ease and you will not regret later on. Wash the zucchini and slice off the ends. Spiralize the zucchini to make noodles and place them in a large mixing bowl. They're quite long so I recommend cutting them once or twice. Next, take a couple paper towels and dab the noodles to soak up the excess water. I used three paper towels but probably could have used one more. In the food processor, mix up the basil, walnuts, EVOO, pink salt and lemon juice and blend until smooth. 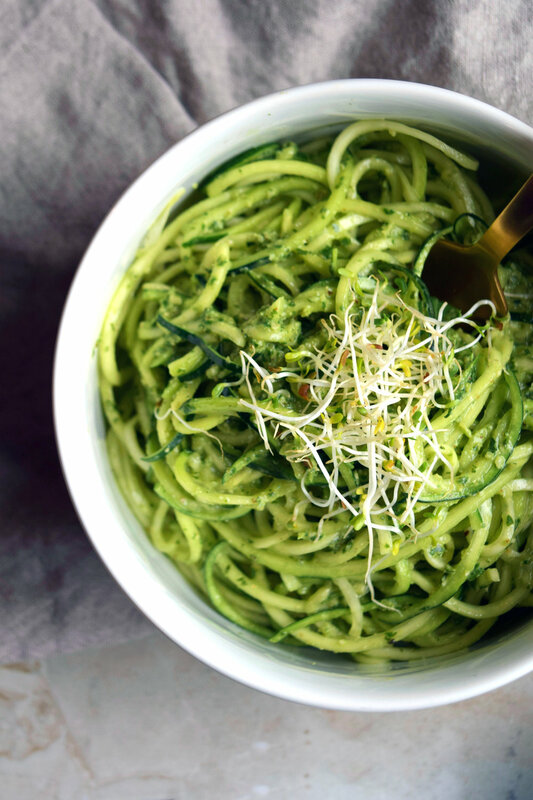 Spoon the pesto into the mixing bowl with the zucchini noodles and stir together so that the zoodles are completely covered. Serve in bowls and sprinkle on nutritional yeast, cherry tomatoes, sprouts or eat on its own!